Thanks to the Pink Stinks Twitter feed I was alerted to a great blog post about Raleigh bikes. I too have fond memories of Raleigh bikes and I was horrified to see how gender-stereotyped they’ve become. For what it’s worth, my current (grown-up!) bike is a Raleigh Volatile: it’s what you might think of as a “girl’s bike” (that is, it has a step-through frame), but it’s not pink. It’s turquoise, with yellow and black writing. OK, it’s actually currently mud-coloured, with added mud, but that’s because I cycle in all weathers and I’m lazy about cleaning it. I prefer a step-through frame not so much because I wear skirts (my chainguard has long since fallen off so I tend to avoid skirts or flappy trousers when cycling anyway) but just because it makes it generally easier to get on and off the bike (particularly as I have a basket on the back, so the running-and-jumping-and-swinging-a-leg-over mount is more or less impossible). But I digress. After reading the Raleigh post, I decided to have a look at some other sites for children’s bikes, to see how widespread the problem was. I started with Halfords; while I wouldn’t start with them for buying a bike, they’re big and fairly popular. Boys: Trax, Apollo Stinger, Apollo Firechief, Apollo Force, Apollo Urchin, Apollo Moonman, Thomas and Friends, Apollo Gradient, Apollo Stunt King, Raleigh Micro X, Ben 10 Alien Force, Marvel Heroes, Raleigh GI, Raleigh Striker, Hood V4, Disney Cars, Ben 10 Ultimate Alien, Apollo Switch, Apollo Ace, Spiderman, Apollo Spider, Apollo Spektor, Raleigh Mini X, Hood Alley, Carrera Blast, Apollo Stomp, Apollo Sandstorm, Diamondback, Apollo Crank, Apollo Ridge, Triumph Daytona, Triumph Dakota, Carrera Detonate, Max DJ20 Boys Dirt Jump Bike, Raleigh Zero, Diamondback Octane, MAX Hornet, Raleigh Chopper, Raleigh Velocity. Girls: Trax, Apollo Honeybee, Apollo Sweetpea, High School Musical, Apollo Sparkle, Apollo Sweetie, Angelina Ballerina, Apollo Daisychain, Ben & Holly, Raleigh Molly, Apollo Popstar, Disney Princess, Hello Kitty, Moxie Girlz, Apollo Ivory, Raleigh Me to You, Raleigh Micro Miss, Apollo Star, Apollo Kinx, Apollo Charm Cruiser, Disney Minnie Mouse, Apollo Moonstone, Diamondback Senorita, Raleigh Mini Miss, Carrera Luna, Apollo Vivid, Apollo Oceana, Apollo Pure, Apollo Tropic, Apollo Krypt, Apollo Craze, Triumph Roma, Triumph Milano, Raleigh Diva, Raleigh AT10. 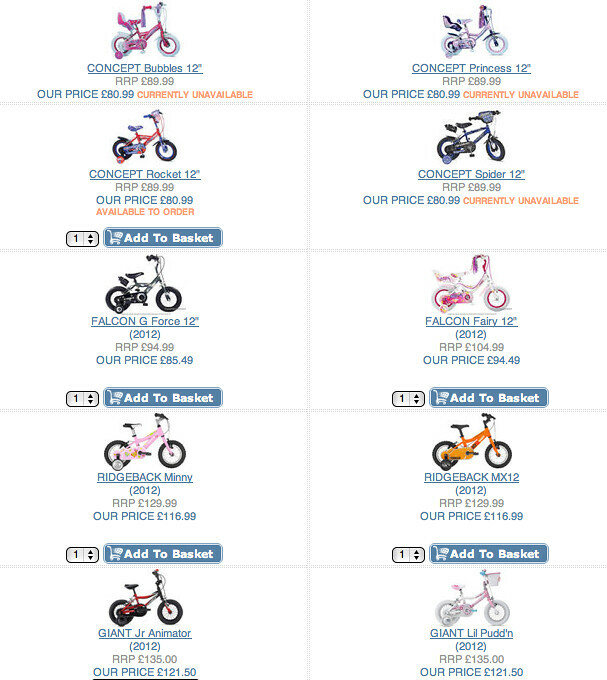 The range of boys bikes available at Halfords.com is second to none. With such a great range of designs and sizes in our collection, there’s bound to be a bike to delight any young lad, whatever type of cycling they’re into. If you’re buying a first bike for your child, we have some great small bikes featuring popular characters from your children’s favourite movies, cartoons and TV shows. But if your kid enjoys exploring or doing tricks, then take a look at our top-of-the-range boys mountain bikes and BMX bikes from brands like Vibe, Apollo, Raleigh and Trax. Boys bicycles, like all kids bikes, can be reserved and collected in-store. Here they can be built by a bike technician free of charge (excludes Trax bikes) – so you can have peace of mind that your boys bike is safe and comfy to ride. We have a fabulous range of girls bikes available at Halfords.com, with a huge variety of designs and sizes to choose from. Our kids bikes feature loads of funky colours and popular characters, so you’re sure to find one that your little girl will love. From balance bikes for beginners, up to girls mountain bikes for the more adventurous, our range includes everything a young girl could need to get into cycling. We’ve even got a great collection of kids bike accessories that match our girls bikes – ideal for budding fashionistas. We’ll fit these free of charge if you buy them at the same time as your bike. If you’re unsure which type of bike to choose, you can use our kids bikes buyer’s guide, or pop in and chat to our store staff. Girls bicycles can be reserved and collected in-store or delivered to your home if you want to hide it away as a present. Boys are expected to be “exploring or doing tricks”. For girls, on the other hand, they emphasise “balance bikes for beginners”, and only the “more adventurous” girls get to try a mountain bike (tricks or stunts are totally off the agenda). Boys are expected to be already “into” cycling (“whatever type of cycling they’re into”), whereas girls will need more persuasion (“our range includes everything a young girl could need to get into cycling” [my emphasis]). Boys get “top-of-the-range” bikes which can be “built by a bike technician”. Girls get “accessories” which are “ideal for budding fashionistas”. And finally, only the text about girls’ bikes includes this last paragraph: “If you’re unsure which type of bike to choose, you can use our kids bikes buyer’s guide, or pop in and chat to our store staff. Girls bicycles can be reserved and collected in-store or delivered to your home if you want to hide it away as a present.” Are girls expected to be more unsure? Is it assumed that it’ll be the girls’ mothers (who are doubtless assumed to be less technical) who will be buying girls’ bikes, whereas boys’ bikes will be bought by their dads? Is it just coincidence that the text for girls’ bikes emphasises shopping (“buyer’s guide”), chatting (“chat to our store staff”), secrets and gifts (“if you want to hide it away as a present”) rather than the sort of physical activity that you might expect to associate with kids’ bikes? All bikes have child specific frame geometry and a full set of proportional components, including brakes that can be operated safely with small hands. Gear ratios are carefully selected to suit the age of the child. Each bike can be customised at the point of purchase with tyres that exactly suit the intended use – you can also have a set of full mudguards and a carrier. This way each bike can be used for mountain biking and cyclo cross, as a track racing machine at your local track league, for going to school, touring holidays or days out exploring with the family. This focuses on the fun activities for which you — whatever your gender — might want to use your bike, rather than the image you might want to project while you’re doing it. The pictures show happy, active, mop-haired children who could easily be girls or boys. The bikes (just “bikes”, not “boys’ bikes” and “girls’ bikes”!) are mostly available in red, blue and purple. Some of the helmets are available in pink (which is fine — pink is just a colour), but they have the same brand name (“Rascal”, “Flume”) whatever colour they come in. The site sensibly acknowledges that the look of the helmet does matter to kids (“kids will not wear something they consider uncool. The childish designs on many kid’s helmets go out of favour at around 5 years old and children then prefer something more adult looking”) but they don’t try to tell you what sort of helmet your child will or should prefer; instead they focus on the safety aspects of the helmets, the design and fit. Amid the sea of gender-stereotyped nonsense it’s refreshing to see something so cheerfully sensible, unstereotyped, unpatronizing, and focused on quality. When my daughter starts asking for her own bike, I may well be (to quote Halfords) “unsure of which bike to choose”, but I know where I’m more likely to go for advice. This entry was posted in Active/passive, Getting it right, Pink and blue, Uncategorized and tagged bikes, blue, cycling, gender, kids, pink by janetmck. Bookmark the permalink. Great post – have you shared it with pinkstinks as well? It’s a sorry state of affairs but I hope that they start to take some notice! Haven’t shared my post with Pinkstinks yet but I guess I should! Islabikes are also really good quality bikes, fwiw – they’re the ones I recommended to parents when I was teaching. They are ace – comparatively pricey, but they appear to fetch a significant percentage of the purchase cost on the second hand market. I love how much my boy loves his and it’s great how good the brakes are and how light it is. Puki Bikes don’t speak about Girls or Boys and are well made: http://www.pukybikes.co.uk/bicycle/index.htm Yes – they may have pink bikes, but there’s nothing wrong with the colour pink in cycling, see anything associated with the Giro d’Italia. They look great – thanks for the link! Absolutely agreed that there’s nothing wrong with pink being an option, so long as it is an option (for girls and boys) rather than an imposition.